First, the flaws of this issue. The action scenes are all-too brief and not really satisfying. In fact, they are over before they even begin and you don’t really get a good sense of who is fighting who, or how. They are confusing to a degree, and that is something I didn’t like. Layman usually writes some great action scenes, but then he also had Jason Fabok doing the pencils before Aaron Lopresti was brought on for this finale arc. And second, I just didn’t buy the whole exposition as much as I wanted to. There was far too much exposition in this issue and it basically summed up the previous issues. And since I’ve been reading the series for like the last ten issues, that isn’t something I appreciated. Layman should have just moved on and if people are lost, they can always just go back to read the previous two issues of the arc. And the story moved forward a bit too fast. I would have liked to see it slow down a bit every few pages and really focus on the character moments between the cast, and work on developing all these relationships. The nature of a comic like this is that we take a lot of the characterisation at face value and as “baggage” from the decades of histories that these characters have. But still, I wanted something a bit more substantial. But, the good parts. I loved Scarecrow’s characterisation in general. And even the ruthless Batman that we get here. Or even the final scene between Batman and Catwoman here, when, in typical superhero fashion, Batman denies himself something that he undoubtedly would like very much to have. Yeah, yeah, it is a cliched scene, but I think it works well in reinforcing the kind of relationships that superheroes generally have. It all adds to the overall grim negativity of the New 52 and even reinforces (in a way) the no-relationship status that DC wants to maintain, but I don’t think that is necessarily a bad thing in this particular case. And just even overall, I think that Layman wrote a fairly good story with Gothtopia. He tried to do something different from the norm with the recent Batman comics and he succeeded. I mean, I’m sitting here, having enjoyed the issue, and that’s what matters most to me: that the writer wrote a fun story. As I’ve already said with respect to the art, Aaron Lopresti’s pencils weren’t up to the mark in the action scenes, especially when we have Batman and Poison Ivy going up against members of the Bat-family, like Batgirl, Catwoman, Batwoman and Talon. And that’s another thing, the other members are conspicuous by their absence. But yes, the art could have certainly been better. That’s not to say though that the rest of the issue wasn’t all that good. He draws very realistic looking characters and he doesn’t draw them in an exploitative manner, which is certainly a nice change of pace from many other comics. And just in general, Art Thibert’s inks and Blond’s colours are pretty damn excellent all the way through. They help make up some of the deficiencies of the pencils. 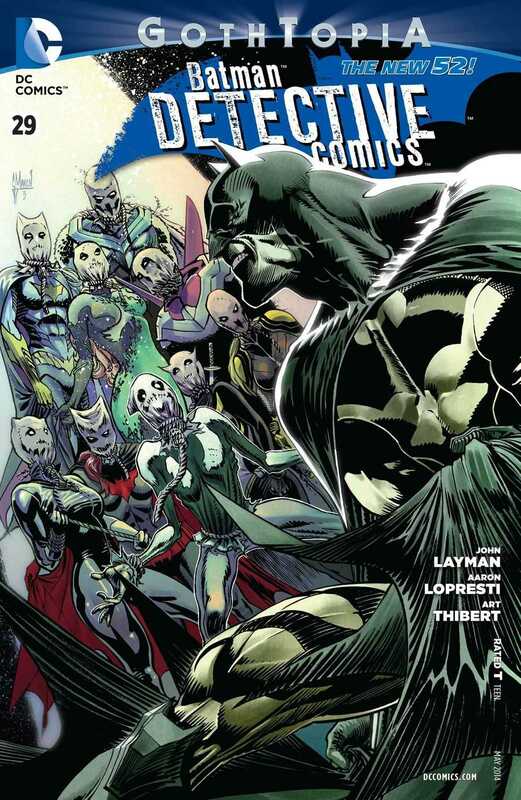 I’m sad to see Layman’s end on Detective Comics coming to an end because I’ve genuinely loved what he has done on the title. But at the same time, it is also nice to see that he is going out on a high note. And Aaron Lopresti’s stay has also been a fun one. More Detective Comics: More Detective Comics: #19-24, #23.4, #27, #28. Posted on March 9, 2014, in Comics Reviews, Review Central and tagged Aaron Lopresti, Arkham Asylum, Art Thibert, Batgirl, Batman, Batwoman, Blond, Catwoman, Comics, Comics Review, Crime, DC Comics, Detective Comics, Gotham, Gothtopia, Harley Quinn, John Layman, Merry Maker, Mr. Freeze, New 52, Professor Pyg, Review, Review Central, Scarecrow, Superheroes, Supervillains, Talon. Bookmark the permalink. 5 Comments.